When will iPhone 4S come to Malaysia??? Currently, this is the list of the countries that first got iPhone 4S on 14th October 2011. And this is the 2nd batch of countries that got the iPhone 4S on 28th October 2011. And this is the 3rd batch of countries that got the iPhone 4S on 11th November 2011. And recently, AirCell, a telco provider in India, announced that India will be getting iPhone 4S on 25th November and the pre-order starts from 18th November 2011 without any information about the price and plans for iPhone 4S. Well, Singapore and India have already got their iPhone 4S. When will Malaysia get its iPhone 4S? Well, Maxis is still very quiet about the launching of iPhone 4S even after Maxis CEO openly announced that Maxis will do its best to bring iPhone 4S as soon as possible to Malaysia. Maybe after Maxis realized that many people are disappointed with iPhone 4S and might affect sales volume, Maxis is renegotiating its terms with Apple for the launching of iPhone 4S. Well, I feel sad that why Malaysia is always not in the list of the first few group of countries to get the Apple latest products. 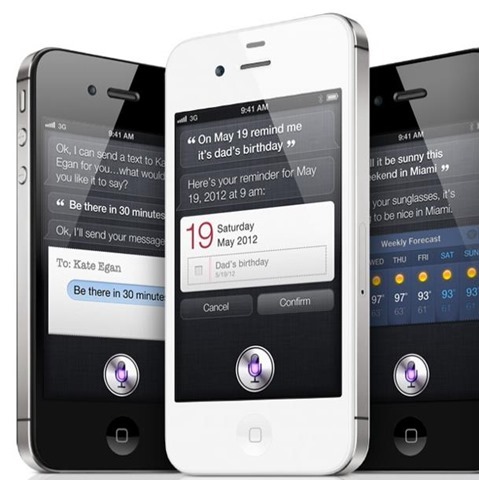 Stay tuned for the latest update of iPhone 4S price and launching in Malaysia. Update: Good news!!! It seems that Maxis might be launching iPhone 4S on 28th November 2011. This is just rumors but let’s hope that it will happen! 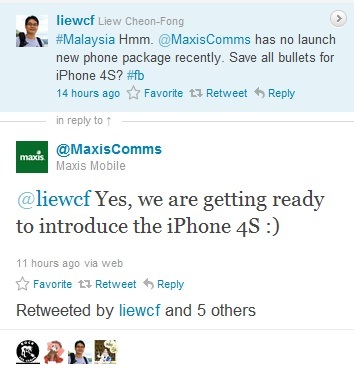 Here’s a print screen of the Twitter conversation between Liew CF, Malaysian top blogger and @MaxisComms. Oh, there is one more thing. iPhone 5 is coming! iPhone 4 is here in Malaysia already!!! iPhone 4S Is Rumored to Come to Malaysia on 16th December 2011??? This guys is Apple fanboys.. Got iPhone, iPad and Macbook there.. Wow! Next story iPhone 4S Is Rumored to Come to Malaysia on 16th December 2011??? Previous story Samsung Malaysia is making our Christmas a bit whiter?